May | 2015 | Mike Lamberti, From Margate To Cleveland, And Back ! 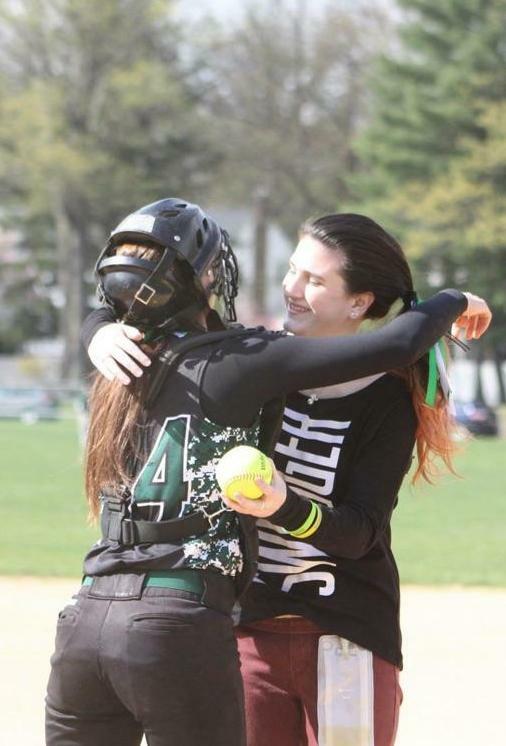 Livingston and Caldwell, two proud high school softball programs, saw their respective seasons come to an end in the NJSIAA sectional semifinals on May 26. Livingston was 18-11, including a pair of wins in the Essex County and NJSIAA tournaments while Caldwell finished 22-7, under veteran coach Mike Teshkoyan. For Caldwell, the season included a Super Essex Conference Liberty Division crown, as well as advancement in the county and state tournaments. 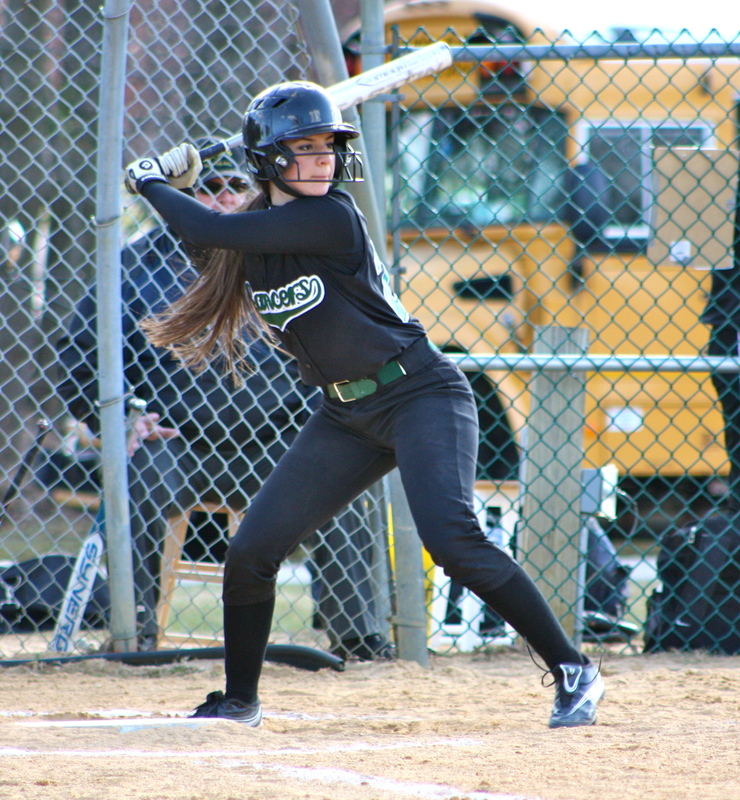 Senior shortstop Gianna Genello (Smarty Jones), who will play at Rowan University this fall, had a marvelous career. The speedy leadoff hitter set the school record for career hits, eclipsing Gina Capardi’s mark of 209 hits, which stood for a decade. Also of note was Caldwell’s Val Murphy, reaching the 100 hit plateau for a career on the same day Genello collected hit number 200. 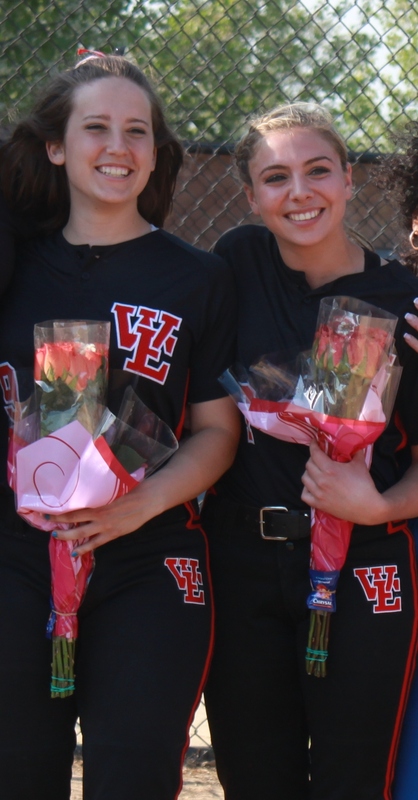 Caldwell shortstop Gianna Genello (right, with teammate Val Murphy) had a marvelous playing career. Murphy also had a milestone season, eclipsing 100 hits. Cayla Lombardi, a senior pitcher, accounted for all 22 of her team’s wins this year. The hard-nosed Lombardi pitched best when her team needed it most. She will attend Seton Hall University this fall. and pursue a career in Nursing. (There will be more on Lombardi in an upcoming blog, looking back at her career). Livingston was led by senior batterymates Marina Lombardi (Silver Charm) and Sammi Passeri. The Lancers, which lost four All-State caliber players the past two seasons to graduation, were very young this year, but still played exceptionally well, under head coach Jason Daily. Lombardi started as a catcher in her freshman year, 2012, working with the legendary Livingston pitcher Jess Peslak (Secretariat). Peslak was a junior in 2012 and coming into her own as one of the state’s best pitchers. Lombardi and Peslak jelled almost immediately and helped the Lancers to back-to-back conference, county and state sectional championships. Marina Lombardi and Caldwell’s Cayla Lombardi are cousins, and the two often played against each other, although not this year. Passeri took over the starting pitching assignment in 2013 and was excellent in the circle the past two years. This year, she and junior pitcher Sydney McCormack (Syd The Kid) both pitched well for the Lancers. Look for McCormack to see a lot of action next year. As for Daily, his work this season has been praised by various coaches in Essex County, including Montclair’s Phil Delgado and Andrea Mondadori Llauget of West Essex. It wasn’t the best six days for West Essex from May 19-May 25. The Knights were upset in the NJSIAA Tournament, then fell to Mount St. Dominic in the finals of the Essex County Tournament on Memorial Day. West Essex ended with an 18-11 record. Graduation will claim two valuable players in Rose Pezzuti and Monica Onorata. The core of the team was made up of sophomores, and those kids should be fired up for 2016. Monica Onorata (right) and Rose Pezzuti at Senior Day. 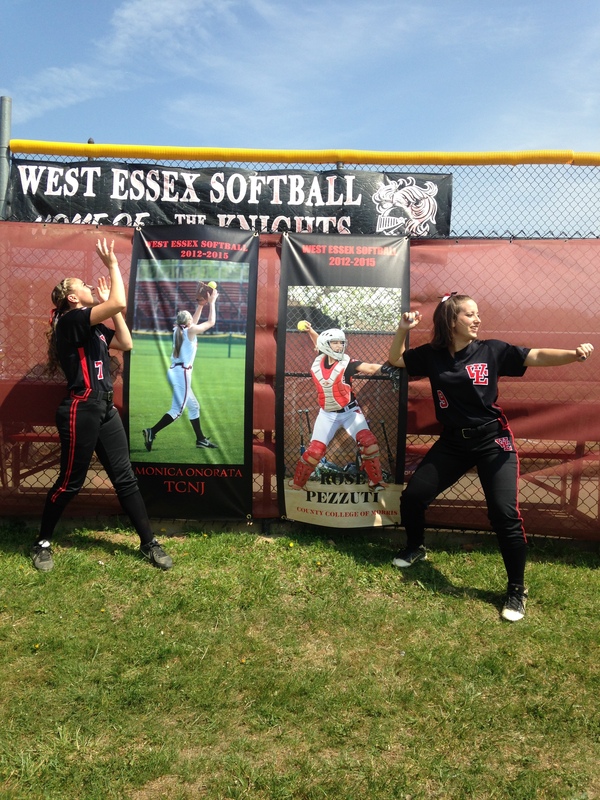 Pezzuti and Onorata had tremendous careers for the Knights. Both will continue playing at the next level this fall, with Pezzuti, A Rose By Any Other Name, (just had to write that one more time) attending County College of Morris while Onorata (Monica7) heads to The College of New Jersey. Head coach Andrea Mondadori-Llauget saw two key players battle injuries during the season. Sophomore Madison Gemma had a back injury which kept her out of the lineup for the last four weeks. Rest should help Gemma get back in the groove by this fall. Sophomore pitcher Sami Huetter was hit in the leg with a line drive in the first inning of the county final. By the time the game ended, Canonero II was in the hospital getting x-rays. She’ll be in a walking boot for a few weeks, but the always upbeat Huetter is already thinking about summer ball and her junior year in 2016. Youngsters like Bridget Betley, Amanda Garofalo, Lily James, Kate Jencarelli, Amanda Schwartz, Alexa Vardiman and Huetter will make West Essex an immediate choice to be among the better teams in Essex County next spring. There’s no other way to describe Mount St. Dominic’s run to a second straight Essex County Tournament softball championship. The Lions didn’t just do it with the usual great pitching by sophomore righty, Kelsey Oh. They did it with a stellar defensive presence, timely hitting to a magnitude not seen that often on the high school level, and a presence that speaks volumes about overcoming any adversity. On the few occasions that MSD has actually trailed in a game, they’ve rallied back with laser precision. And on May 25, the 38th Essex County Tournament championship was sealed with a first inning for the ages. Head coach Lorenzo Sozio’s team actually trailed second seeded West Essex, 1-0, heading into the bottom of the first. Seemingly hours later (it wasn’t that long), the Mount had a 12-1 lead before West Essex batted again. The win marked the second time the Lions had won back-to-back county titles (it first happened in 2008 and 2009) and this year’s championship was the sixth in the program’s history, all since Sozio became head coach in 1996. Only Caldwell, with 10, has won more. This year also marked the eighth time in the last nine seasons that MSD has appeared in the ECT final. She may be called ‘Real Quiet‘ in this blog, referencing a stud race horse from a few years back, but MSD senior Ally Dabroski, the lone upperclassman on the roster (how scary is that for 2016?) was 3-for-3 in her usual leadoff role, and once again, personified winning at the highest level. When her high school career concludes (hopefully for MSD fans on June 6), she will leave with a legacy of winning that already includes two ECT titles, a pair of SEC championships and a state title in 2014. The kid is a winner, no ifs, ands, or buts. And a younger core of players, starting with Oh, a thoroughbred who combines speed and good movement to overwhelm hitters at times, should keep the Lions at, or near the top, in 2016 and beyond. Even though MSD won last year’s championship, 10-0, there was no comparison to what the fans saw this year. MSD (29-1 after a state tourney victory on May 26) had lost some key players from last year’s Triple Crown (ECT, SEC and NJSIAA) champions. Nevertheless, many will say this year’s team may be better. Just watching them play defense was intoxicating. Ground balls are handled effortlessly. The ensuing throws from second, short, or third base, to first are pinpoint accurate. At the plate, all nine batters will hit for power, but can also play small ball effectively. Before Sozio and his staff will acknowledge any kind of coronation, there’s the matter of the state tournament. A showdown with either immaculate Heart, or DePaul, will probably decide the North, Non-Public A championship next week. 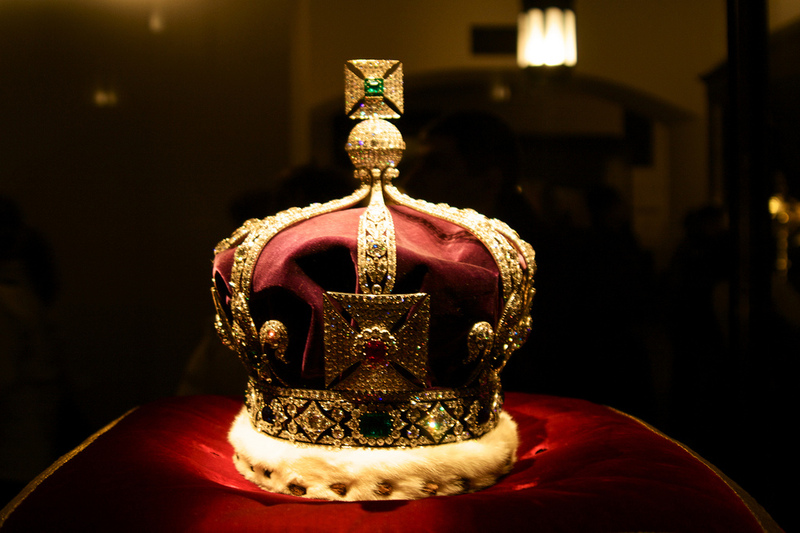 And on June 6, Notre Dame, or St. John Vianney could be the South representative for the Non-Public A crown. Those will not be easy games, and the MSD players know it. But with the way they’re currently performing, the Lions are working hard to ensure a legacy of greatness. The 38th Essex County Tournament should feature an excellent championship game on May 25, as the top two seeds meet at Ivy Hill Park. Top-seeded Mount St. Dominic, the defending champion, will take on the second seed, West Essex, at 6 p.m. Both teams won exciting semifinals last week, as West Essex edged Nutley, 1-0, thanks to a classic slide at home by Monica Onorata in the bottom of the sixth, while Mount St. Dominic defeated Livingston, 5-1, in a well-played game. The pitching should be tremendous, as West Essex’s Sami Huetter (Canonero II) and Kelsey Oh of Mount St. Dominic have to be considered the top two hurlers in Essex County. Most will also counter that Oh is the best high school pitcher in the state, or among the top three, for sure. And what makes this matchup so intriguing is that both pitchers are sophomores, and the nucleus of West Essex and Mount St. Dominic consists of underclassmen, meaning a potentially great rivalry is brewing here. Mount St. Dominic has had the better of this rivalry, lately. The Lions have beaten the Knights twice this year and haven’t lost to West Essex since 2012. But a tremendous game earlier this season at West Essex, which MSD won, 1-0, in extra innings, may give a good indication of an intense rivalry brewing. Huetter and Oh hadn’t faced each other until that game in April and it was everything expected of a classic horse race. This is the second time the schools will meet for the ECT championship. Eight years ago, West Essex prevailed, 2-0, in the final. The Knights last appeared in the county final in 2010, when it lost to Cedar Grove, 2-0. Mount St. Dominic is seeking its sixth county title, which would put it second, all time, in ECT history, trailing only Caldwell’s 10 crowns. This is also the eighth time in the last nine seasons that MSDA will play for a championship. The Lions are 3-4 in title games during that span, and a win will mark the second time the program has repeated as champs. Not surprisingly, Montclair coach Phil Delgado was at last Sunday’s ECT semifinals at Ivy Hill. The guy lives for softball and the first-year coach for the Mounties couldn’t be happier that he’s coaching in Essex County. Delgado’s enthusiasm speaks for itself. He could easily have complained that competing in the SEC’s American Division wasn’t in his team’s best interest in 2015, but he’ll hear none of it. Instead, he embraced the challenge his team has faced, playing the likes of Mount St. Dominic, Livingston, Nutley and West Essex twice. His respect for opposing coaches is also infectious. “I enjoy coaching against ‘Mondo’ (West Essex’s Andrea Mondadori), Bob (Bloomfield’s Mayer), Lorenzo (Mount St. Dominic’s Sozio) and Luann (Nutley’s Zullo),” he said. But Delgado holds the biggest accolade for Livingston’s Jason Daily. In the off-season, Delgado coaches and trains a number of the kids who play in Essex County, and it’s clear the respect those players have for him. Montclair has had its share of coaching changes. Since 2009, Delgado is the fourth different head coach, which can’t help a program’s stability. The stronger programs in Essex, such as West Essex, Bloomfield, Livingston and Mount St. Dominic have enjoyed the comfort of a head coach who averages 15 years on the job, maybe longer. Let’s hope Delgado is the long-term answer for the Mounties. The Bergen County Tournament will certainly test a team’s mettle. The semifinals will feature two tremendous games, as Immaculate Heart takes on Indian Hills, at 11 a.m. and Demarest faces Northern Highlands at 1 p.m. Both games will be played at Indian Hills, in Oakland, on Saturday, May 23. Last Sunday’s quarterfinals were riveting, according to IHA coach Anthony LaRezza. Fans will recall that IHA and Indian Hills met in a classic championship game last season, with Hills winning on a walk-off homer in the bottom of the seventh inning. LaRezza has the highest regard for Indian Hills’ Joe Leicht, and it’s pretty obvious the feeling is mutual. After Hills’ victory in last year’s title game, Leicht made it a point of reaching out to LaRezza before taking part in any kind of celebration. You have to think with the quality of softball in Bergen County, all of the Final Four teams will be favorites to win, or advance to a final, in its respective state section. 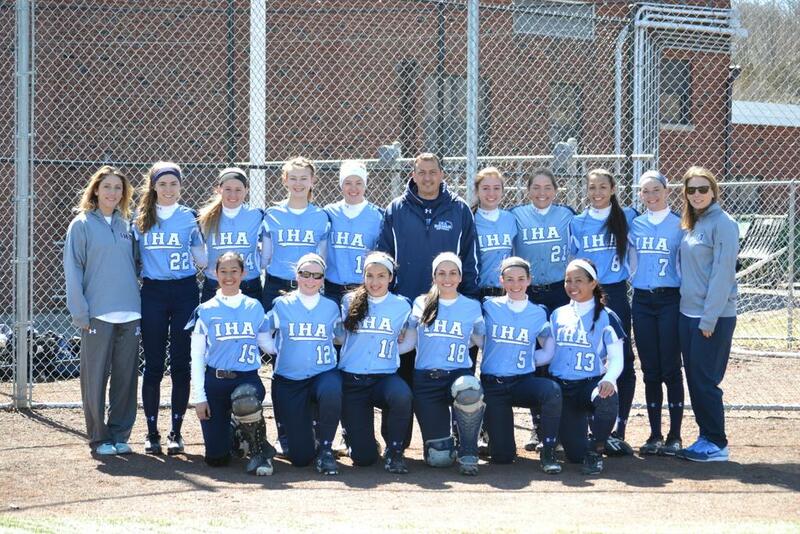 As far as IHA, the Eagles lost back-to-back games a few weeks ago, and have been on quite a run, since. LaRezza had said at the outset of the season he wasn’t sure how good this year’s team could be, but at this point, you have to think they’re a favorite to be in the running for a county and possible state crown. As a mater of fact, Indian Hills and Northern Highlands could meet in a sectional semifinal, as well as a county championship game, with wins in their respective games. And don’t discount Demarest, who is also in the same section as Highlands and Hills. Demarest faces Hills in a sectional quarterfinal on May 20 and could face them again in a county championship game. Crazy, for sure, and some great games for fans to enjoy. Here are the updated FMTC Top 10 rankings. The Essex studs, so far, in 2015. Sunday’s Essex County Tournament semifinals at Ivy Hill Park will feature two outstanding games, with four teams that have enjoyed tremendous success in the tournament. The 38th ECT is down to the Final Four, with West Essex and Nutley meeting first in a battle of the second and third seeds, at 5 p.m, followed by a 7 p.m. contest between fifth seeded Livingston and Mount St. Dominic, the top seed and defending champion. Between the four schools, 15 county titles have been won, with MSD and Livingston tied for second, all time, in the tourney’s history, with five championships each. (Caldwell has the most titles, with 10). West Essex has three championships, with the last coming in 2007 while Nutley has won two titles, in 1993 and 2011. Current Nutley coach Luann Zullo led West Essex to back-to-back crowns in 1997 and 1998, then guided the Raiders to the 2011 championship. Zullo is the only coach to have coached two different schools to ECT championships. The games themselves should also be interesting, since Nutley and West Essex generally have really intense matchups. The two could also meet in the NJSIAA tournament later this month. Last year, Nutley eliminated West Essex in the state tourney. And it goes without saying that a Livingston-Mount St. Dominic game never disappoints. The two schools met in the 2012 and 2013 ECT finals, with the Lancers winning two close, hard-fought games. This year, the Mount has to be considered the favorite, but Livingston has been playing well of late, including a very impressive win over Cedar Grove last Saturday in the quarterfinals. The dates of the semifinals and finals were changed recently, because of a conflict with possible first round state tournament games. And with that said, the NJSIAA tourney could have a good Essex showing this spring, with teams like Cedar Grove, Verona, West Essex, Nutley, Mount St. Dominic, Livingston, Caldwell and Newark Academy advancing deep in their respective brackets. So, with that said, enjoy the ECT games this Sunday. The semifinal winners will meet on Memorial Day, Monday, May 25, for the championship at Ivy Hill. And by next week, we’ll have a good idea of what teams will be making serious runs in the state tournament, too. Caldwell’s senior shortstop Gianna Genello was closing in on a coveted school record. Entering her team’s May 14 state game with Harrison, Smarty Jones was two hits shy of breaking Gina Capardi’s mark of 209 career hits. Capardi played at Caldwell from 2002-2005. Here are the updated FMTC rankings. Sort of a quiet week for the Lions, who were set to play Livingston in a SEC game on May 13, then face Livingston again on May 17 in the semifinals. Sophomore pitcher Kelsey Oh will be tough to handle in the county tournament. Coming down to the wire for a talented team, which already has 20 wins. The Raiders are the top seed in its state section, but also have eyes on bringing home that ECT crown. An ECT semifiinal pitching matchup between Spectacular Bid (Carly Anderson) and Canonero II (Sami Huetter) should have the fans buzzing on Sunday. Are the Knights playing its best softball now? Could be, especially with impressive wins over Bergen powers Lodi Immaculate and Indian Hills, as well as a 2-0 mark against Livingston, something that hasn’t happened since 2010. A trip to the ECT final for the first time in five years means beating Nutley in the semis. Should be fun. Coach Jason Daily’s team played six games in six days from May 4-9, and were 4-2 in those matchups, including a big win at Cedar Grove last Saturday night in an ECT quarterfinal. While they’re the underdog in this year’s semifinal, expect a young Livingston team to give a good effort. Lancers could also be a team to watch in the state tournament. Panthers will be among the favorites to win a state sectional title. An aggressive offense and good pitching will make them formidable. 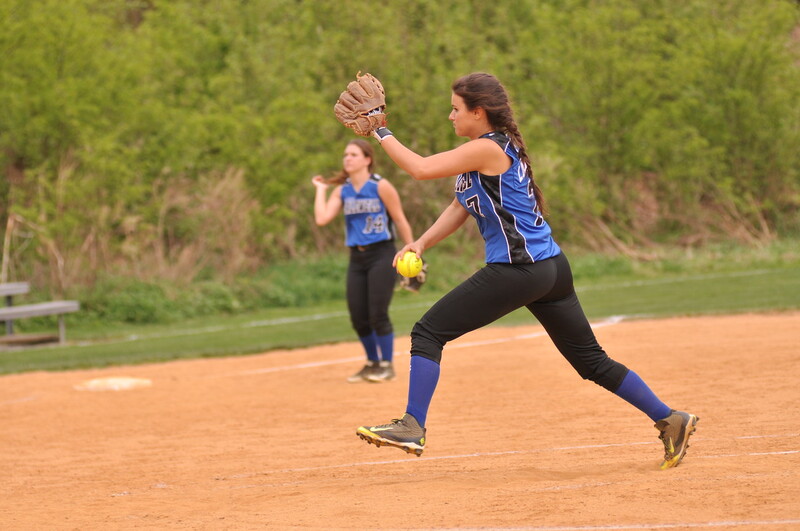 Senior pitcher Cayla Lombardi won her 20th game in a win over Passaic Valley on May 12. Chiefs have a long and storied history in state tournament play and this year’s team could add to that tradition. Caldwell could have at least two home games in the states, starting with a May 14 contest against Harrison. Seventh seeded Cougars having a very good season, and will host a first round state game against Piscataway. It’s been a frustrating year for the Bengals, but this team plays hard every time out. A first round state game against a familiar foe in Bloomfield will be interesting. Hillbillies having a very good season and will host Hasbrouck Heights in a first round state game. You always wonder if this team can make a good run in the Non-Public B tournament. Minutemen get a bye in first round of states and could face top-seeded Lodi Immaculate in the North semifinals. 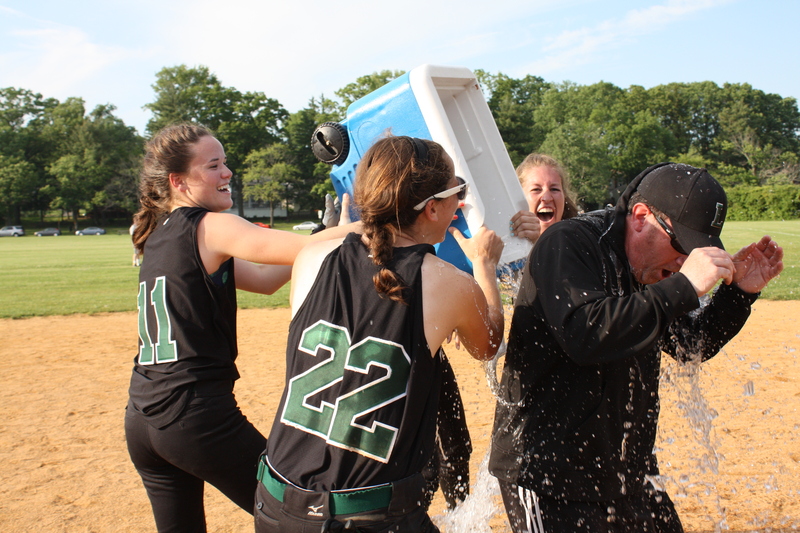 This blog has long had a race horse theme when it comes to Essex County softball. 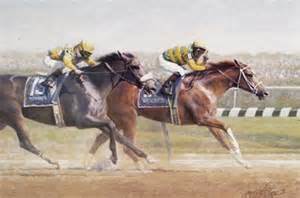 And, of course, the ultimate goal for any racehorse is to win a triple crown. In Essex County, that’s a rare accomplishment. The triple crown for high school softball is generally a conference title, county championship and ultimately, a state championship. Caldwell accomplished that feat a decade ago, behind their great pitcher, Kristen Schindler. If stud nicknames were being used back then, she would have been called ‘Citation‘. In 2012 and 2013, Livingston accomplished it, somewhat, by winning the conference, county and state sectional title, but the Lancers fell short in the Group IV semifinals both years. Last year, Mount St. Dominic won its triple crown in the most impressive fashion, dominating in its conference and county, then winning two incredible games in the Non-Public A tournament to secure a state championship. MSDA is beginning to build its crown for 2015, having added already the first diamond with a conference title. A year later, some of the names have changed, but the Lions (22-1 entering games of May 6) are probably stronger this year, as coach Lorenzo Sozio’s team seeks what would be an unprecedented second TC by an Essex-based team. Jewel one is already on the crown, as the conference title is secured, with the team unbeaten in league play. In about a week, we’ll find out if the Lions’ bid to repeat as Essex County champions is fulfilled. Mount St. Dominic is a clear favorite to win there, but that road could be challenging, with some good matchups possibly in the Final Four. If Mount St. Dominic does win the county title, it will be the program’s sixth crown, moving it ahead of Livingston for second most ECT championships. (Caldwell has the most, with 10). Sozio has guided the Mount to all five of its titles, thus far. A team’s success relies mainly on good pitching, and there’s no question that MSD has the stud of studs in the circle in sophomore righty, Kelsey Oh. In 2014, Oh led the Mount to the state championship with some incredible pitching down the stretch. She’s been nearly unhittable in 2015. But let’s not forget a potent offense, and outstanding defense, featuring Ally Dabroski, Elizabeth Cowell, Helyna Bissell and up-and-coming freshman Sarah Taffett. Dabroski, the lone senior on the team, is clearly a stud, a ‘Real Quiet‘, kind. She just plays the game at a high level, every time out. So, sit back and enjoy some good softball leading up to the county championship, and following that, the road to a state title begins. Congratulations to Erin Stacevicz of Cedar Grove and Gianna Genello of Caldwell on collecting their 200th hit a few days apart this past week. 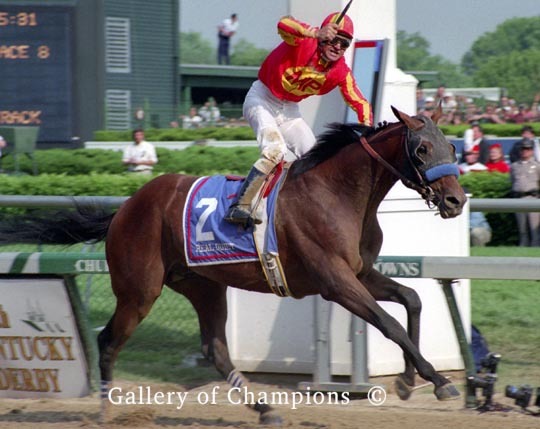 Stacevicz (California Chrome) and Genello (Smarty Jones) are both senior shortstops, with exceptional speed at the plate and a tremendous defensive presence. The Lions are far and away the best team in Essex, thus far. Honestly? You can almost flip a coin from 2-5 in the rankings, but the Raiders are here for a few reasons. They have the best offense, outside of MSD, and maybe the best pitcher in senior Carly Anderson, who will make a Spectacular Bid for a county championship. When Canonero II (Sami Huetter) is in the circle, they’re as good as anyone. West Essex is still a very young team, however, and with that comes inconsistency at times. Knights face Livingston on May 6 in what should be a really good game. The Big Green Machine has gotten really good pitching from senior Sami Passeri and junior Sydney McCormack. Both have different strengths and head coach Jason Daily won’t hesitate in using both during the course of a game. Lancers face Cedar Grove on Saturday in a ECT quarter. There is absolutely no question that Cedar Grove can compete with any team in the county, including Mount St. Dominic. California Chrome is so good, it’s scary. The Panthers can swing the bats and have above average pitching. The Chiefs made it to a county semifinal last year, and if they do it again in 2015, it will mean beating long-time nemesis, Nutley, on May 8 in the quarterfinals. Caldwell has been playing well, led by Smarty Jones, Christina Guarino, Val Murphy and ‘The Bear‘, Cayla Lombardi. 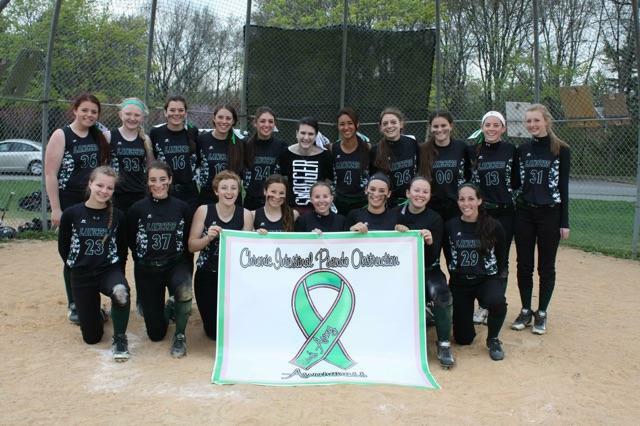 The Cougars are putting together a very good season and will play West Essex in a ECT quarterfinal game on May 9. It won a thriller last Saturday over Millburn in a first round ECT game. Don’t let the record fool you, this team can play. Bengals have lost five games by one run and two more by two runs. Still think they’re capable of getting a big upset before the end of the season. Bloomfield is in the county quarters and play at top-seeded MSD on May 11. Hillbillies are out of county tournament, but have to think they’ll be a factor in its state section. Minutemen gave Nutley all it could handle in the first round of the ECT and had a good win the other day against Columbia. The Essex studs, so far, in 2015. Note a few new names since last week. Congratulations to Caldwell High softball coach, Mike Teshkoyan, who won his 615th career game last week, surpassing retired Jefferson coach Ed Levens on the state’s all time win list. Teshkoyan is Essex County’s all time winningest coach. He’s been at the helm in Caldwell since 1987 and has guided the Chiefs to eight county championships. Caldwell has won the most titles, 10, since the ECT began in 1978. The 38th Essex County Tournament heads into the quarterfinal round, with four very good matchups. Livingston will visit Cedar Grove while West Essex is host to Columbia, on Saturday, May 9. Caldwell travels to Nutley on May 8 and Mount St. Dominic, the top seed, will host Bloomfield on Monday, May 11. The semifinals and finals are set for Ivy Hill Park, in Newark, on May 15 and 16. Caldwell senior pitcher Cayla Lombardi has been throwing very well of late. Her resiliency in close games is one of the reasons why the Chiefs were 17-4 through games of May 5. Lombardi has closed the door in the late stages of close games, as Caldwell won low-scoring, intense contests against Paramus Catholic, Bloomfield, Verona (twice) and Belleville over the past few weeks. 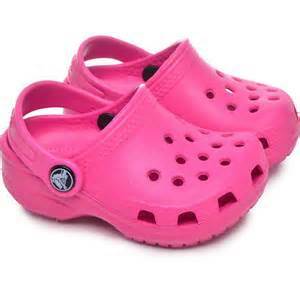 As hard-nosed as she appears in the circle, it’s those pink croc shoes she wears after games, which are indeed a classic. Seriously, she’s been a very effective player in 2015, and with a veteran squad behind her, Caldwell could be a major factor in both the ECT and state sectional tournament. And speaking of Caldwell, keep an eye on sophomore catcher Christina Guarino, who is quickly becoming one of the best behind the plate in Essex County and also has a potent bat. Sami Huetter appears to be very happy in her role as West Essex’s number one pitcher. The sophomore righty is having a tremendous season in 2015, and is one of the reasons why a young team is among the favorites to advance in the county tournament. Huetter stopped by the Livingston-Montclair county game last Saturday, to watch a few friends from her club team play. When asked about possible college plans, the affable Canonero II wasn’t thinking that far ahead, yet. If you haven’t seen Belleville play this year, you should. Chris Cantarella has an exciting young team playing well in 2015. One of the few seniors on the team is Sarah Guy, a third baseman who excelled in Belleville’s first round county tournament game against Caldwell on May 2. Guy homered and also made two outstanding defensive plays at third base. The newest FMTC ‘Stud’, Charismatic plans to attend Montclair State University in the fall. The ‘other’ Charismatic, pulling ahead in a race. Montclair’s first-year coach Phil Delgado must sleep well at night. He’s so intense in coaching his team that it’s hard to believe he has much energy left past dinner time. Delgado doesn’t believe in grass growing under his players’ feet. Every pitch is a teaching moment, every swing has a message. He is quick to point out a mistake, not to embarrass a player, but to help her get better. As much as there’s a laser focus, he’s quick to encourage a player, even if she misses out on a catch, or a tag. For Delgado, it’s about hustling, intensity and trying hard. And as long as the Mounties are doing that, the improvement will come as well. Livingston came together to help a young lady battling a rare disease. Sara Gebert is a 19-year-old girl from Pittstown, New Jersey. Over the past two years, the competitive softball pitcher had shed 30 pounds, and was forced to drop out of Fairleigh Dickinson University because she was often too sick to get out of bed. Sara was diagnosed with Chronic Intestinal Pseudo Obstruction (CIPO) and Gastroparesis. These conditions are so severe that she is considered to be in intestinal failure. She is fed overnight straight into her heart with Total Parenteral Nutrition (IV nutrition). She has to drain her stomach 24/7 because her body is unable to contain its own digestive contents. On May 1, the Livingston High softball team, led by senior catcher Marina Lombardi, welcomed Sara to the team’s game against Montclair. Marina gave a stirring speech to the crowd, and then Sara threw out the first pitch. The event was also a fundraiser, where baked goods and bracelets were sold. Marina (left) and Sara had a good day on the field. Sara (back row, center) joins the Big Green Machine for a photo prior to the team’s game. There are only about 150 cases of CIPO diagnosed a year worldwide, and there is no cure. Symptoms can be managed, but this usually requires very invasive surgeries and expensive medications that often are not covered by insurance. Sara lives every day with severe pain and constant nausea. She has good days and bad days. Sara has set out to form ‘Sara’s Army’, a nonprofit organization created to raise awareness and funding for her own medical treatments as well as research towards a cure for this disease. 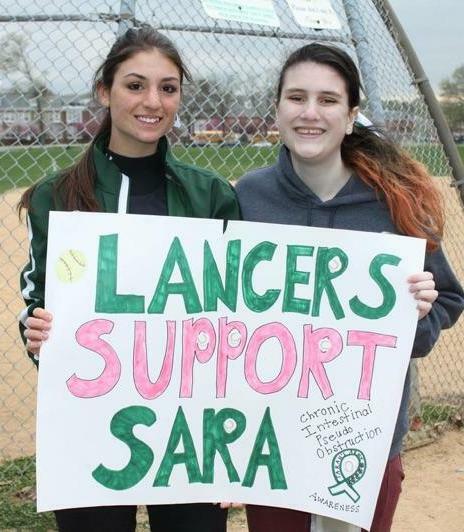 Marina subsequently befriended Sara through her website and talked about softball, and how the Lancers would like to build awareness on CIPO and support Sara’s Army. If you’re interested in learning more about Sara’s Army, or possibly making a donation, check out the website at http://www.sarasarmy.com. 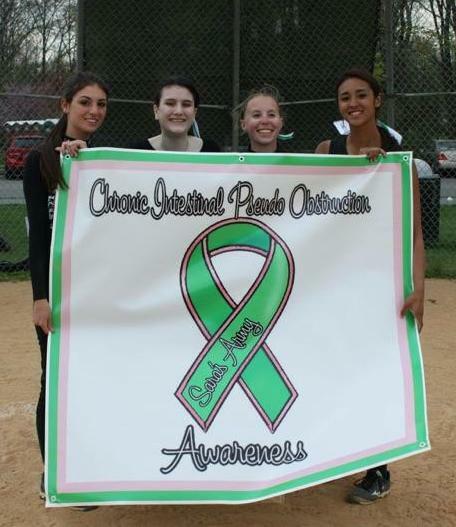 Caldwell’s seven game winning streak may have come to an end with a 4-3 loss to a good Montville team on May 5, but it was still a memorable day for the Chiefs’ lofty program. 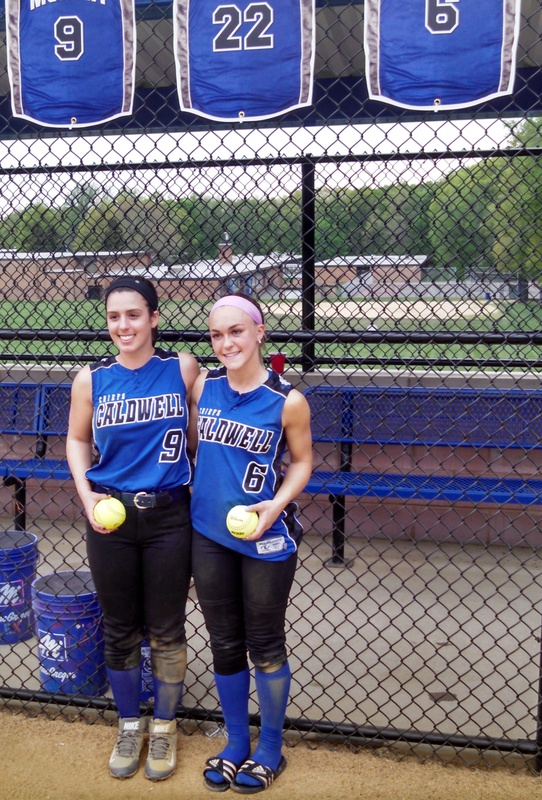 The most successful team in Essex County history (Caldwell has won 10 county titles) added a pair of lofty milestones, as Gianna Genello, a senior shortstop, reached the 200 hit plateau while Val Murphy, also a senior, picked up her 100th career hit. Both milestones came in the respective player’s final at-bat of the day. Gianna Genello (right) and Val Murphy after the duo reached tremendous milestones on May 5. Genello needed three hits entering the Montville game and finished 3-for-4 with two runs scored, a typical game for Smarty Jones. The record for most hits in a career at Caldwell is held by Gina Capardi, who had 209 from 2001-2005. Genello is well within that mark, as well, since Caldwell (17-4) has at least eight games left in its season, and possibly more. Murphy knew she was somewhat close to the century mark, but had no idea she needed two hits to reach 100 entering today’s game. Mike Teshkoyan, who is in his 29th season with the Chiefs and is the winningest coach in Essex County history, was very pleased for the two.